Kick off your visit on the 30th (Sun): take in the exciting artwork at Glasshouse Studio and then enjoy the sand and surf at Alki Beach. To see more things to do, reviews, and other tourist information, refer to the Seattle trip planning website . Knoxville to Seattle is an approximately 8.5-hour flight. You can also do a combination of car and flight; or drive. Due to the time zone difference, you'll gain 3 hours traveling from Knoxville to Seattle. Plan for a bit cooler temperatures traveling from Knoxville in June, with highs in Seattle at 74°F and lows at 57°F. Wrap up your sightseeing on the 1st (Mon) to allow time to travel to Sequoia and Kings Canyon National Park. Start off your visit on the 2nd (Tue): hike along Lakes Trail in Sequoia National Park, then admire all the interesting features of Generals Hwy, and then trek along Congress Trail. On your second day here, take in the dramatic natural features at Moro Rock and then delve into the lush surroundings at Giant Forest. To find traveler tips, photos, reviews, and more tourist information, read Sequoia and Kings Canyon National Park online sightseeing planner . You can fly from Seattle to Sequoia and Kings Canyon National Park in 6 hours. Other options are to take a bus; or take a train. Plan for somewhat warmer temperatures traveling from Seattle in July, with highs in Sequoia and Kings Canyon National Park at 98°F and lows at 66°F. Finish your sightseeing early on the 3rd (Wed) so you can travel to Point Reyes National Seashore. On the 4th (Thu), tour the pleasant surroundings at Sculptured Beach, then visit a coastal fixture at Point Reyes Lighthouse, and then kick back and relax at Drakes Beach. To see reviews, other places to visit, photos, and other tourist information, use the Point Reyes National Seashore trip planner. Use the Route module to find suitable travel options from Sequoia and Kings Canyon National Park to Point Reyes National Seashore. Expect a bit cooler temperatures when traveling from Sequoia and Kings Canyon National Park in July; daily highs in Point Reyes National Seashore reach 84°F and lows reach 52°F. Cap off your sightseeing on the 4th (Thu) early enough to travel to Yosemite National Park. Get in touch with nature at Cathedral Beach Picnic Area and Glacier Point. 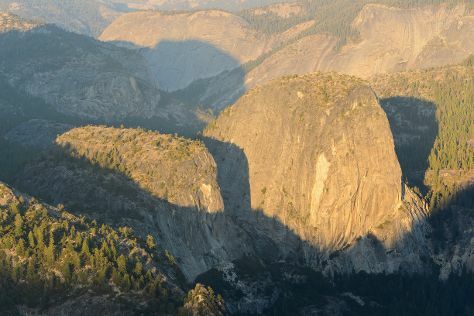 The adventure continues: trek along Mariposa Grove of Giant Sequoias, explore the striking landscape at Sentinel Dome, tour the pleasant surroundings at Lembert Dome, and admire the sheer force of Vernal Fall. To find where to stay, maps, more things to do, and other tourist information, read our Yosemite National Park day trip planner . The Route module can help you plan travel from Point Reyes National Seashore to Yosemite National Park. Traveling from Point Reyes National Seashore in July, Yosemite National Park is slightly colder at night with lows of 46°F. Wrap up your sightseeing on the 8th (Mon) to allow time to take a bus to Mammoth Lakes. Mammoth Lakes is a town in Mono County, California, the county's only incorporated community. On the 9th (Tue), tee off at Snowcreek Golf Course, then sample the tasty concoctions at June Lake Brewing, and then identify plant and animal life at Mono Lake County Park. For other places to visit, where to stay, photos, and other tourist information, you can read our Mammoth Lakes attractions planner. You can take a bus from Yosemite National Park to Mammoth Lakes in 1.5 hours. In July in Mammoth Lakes, expect temperatures between 83°F during the day and 46°F at night. Finish up your sightseeing early on the 9th (Tue) so you can go by car to Death Valley National Park. On the 10th (Wed), explore the activities along Badwater Basin, then steep yourself in history at Eureka Mine, and then take in the dramatic natural features at Zabriskie Point. For where to stay, maps, ratings, and tourist information, refer to the Death Valley National Park trip itinerary planner . Traveling by car from Mammoth Lakes to Death Valley National Park takes 3.5 hours. Alternatively, you can do a combination of bus and car. Expect somewhat warmer weather when traveling from Mammoth Lakes in July: highs in Death Valley National Park hover around 101°F, while lows dip to 73°F. Wrap up your sightseeing on the 10th (Wed) early enough to drive to Las Vegas. Step out of Las Vegas with an excursion to Hoover Dam in Boulder City--about 50 minutes away. The adventure continues: take in breathtaking views at Red Rock Canyon National Conservation Area, try to win big at Paris Las Vegas, admire the local landmark of Bellagio Fountains, and shop like a local with The Strip. To find reviews, photos, traveler tips, and tourist information, read our Las Vegas itinerary maker website . You can drive from Death Valley National Park to Las Vegas in 2.5 hours. Another option is to take a bus. Traveling from Death Valley National Park in July, you can expect nighttime temperatures to be somewhat warmer in Las Vegas, with lows of 81°F. On the 13th (Sat), wrap the sightseeing up by early afternoon so you can travel back home.